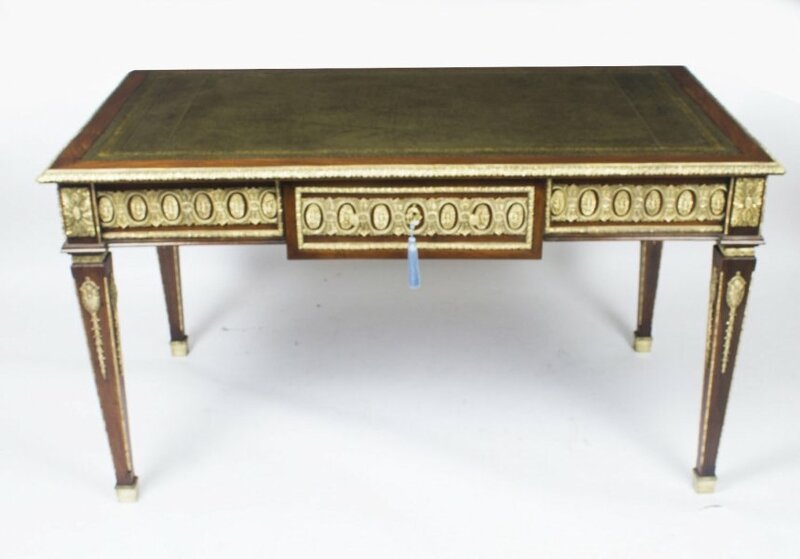 We present to you this is a fine and rare antique ormolu bureau plat desk. 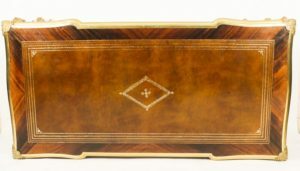 It is a mounted French kingwood bureau plat after Charles Cressent, dating from around 1860. It bears the label of Bedle & Cie and features wonderful highly decorative ormolu mounts. 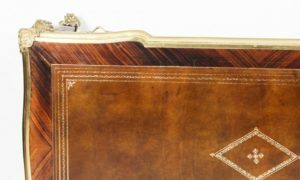 The shaped rectangular top of this delightful antique ormolu bureau plat desk has a decorative ormolu border and is inset with a superb gilt-tooled tan leather writing surface. It has one long central and two short shaped frieze drawers on one side and false drawers on the other. All the drawers have working locks and keys. 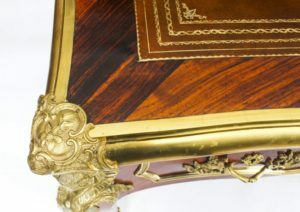 The desk is raised on beautiful slender cabriole legs headed by stunning scrolled foliate and shell-cast Venus mask espagnolettes, terminating in ormolu lion’s paw sabots. Each side of this antique ormolu bureau plat desk is mounted with an acanthus, scroll and lambrequin adorned ormolu Diana Mask and, as an added bonus, it is finished on all sides so that it can stand freely in the centre of a room. This piece follows the celebrated Charles Cressent model, one of which forms part of the renowned collection at the John Paul Getty Museum in Los Angeles. Charles Cressent (1685–1768) was a French furniture-maker, sculptor and founder of the régence style. He was a pupil of the renowned André Charles Boulle and is widely viewed as one of the best decorative artist of the 18th century. This antique ormolu bureau plat desk is a truly exquisite and historic piece which will display beautifully in any interior and surely become the focus of your guests admiring attention. This antique ormolu bureau plat desk is in an exceptional condition having been beautifully cleaned and polished in our workshops as can be observed in the images we have supplied in our set of pics. Kindly take a few minutes to take a look at them and assure yourself of this. We are certain you will agree that it’s a good idea to see important items such as this antique ormolu bureau plat desk face-to-face before you decide. Being mindful of this, we are really delighted to welcome buyers to come to our North London display room to see this gorgeous antique ormolu bureau plat desk in person. Whilst you are here you will also be able to go over our comprehensive selection of other attractive collectibles and also explore any queries or issues that you have about this item. Our internal specialists are at hand to help answer queries, not just about this antique ormolu bureau plat desk but also regarding antiques and collectibles more generally. The company has a great deal of expertness and are always delighted to advise. Please call ahead of time to schedule a session so that we can be certain we have the right expert available to assist you. We occasionally open on Saturdays, so if you would like to come at a weekend, please get in contact beforehand to make sure that we will be open. We want to avoid you making a pointless trip. When contacting us please be sure you have got the item reference number at hand: 08971, so we can be certain which precise object you really want to speak about. You can find our contact details by following the ‘Find Out More’ button. Our London showroom is open Mon to Fri 10am – 5pm for you to see this antique ormolu bureau plat desk. We also open from time to time on Saturdays – but please be in touch ahead of time before making the trip on a Saturday to make sure we will be open as we really do not wish you to be disappointed. 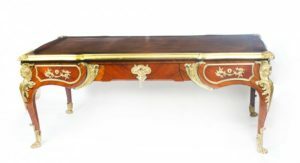 If you are unable to travel to us, then we are always delighted to resolve any questions you could possibly have about this antique ormolu bureau plat desk by email or telephone. We have internal advisors who will be keen to support you with any aspect of your proposed purchase, so why not take the opportunity to learn more. When you make contact please don’t forget to quote the item reference number so we know which of our many items you are thinking about. You will see both our email address and our telephone number on this page. 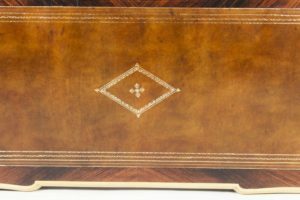 Fantastic objects such as this antique ormolu bureau plat desk require professional packing and transport to guarantee they get to you in the exact condition that they left us. We take great pride in our shipping know-how and can send to just about any destination globally. However, we ask you to get in touch to review delivery arrangements and obtain a quotation before making any acquisitions, as we need to be positive that we can satisfy all your transportation specifications. As you will appreciate, some things require delicate handling and we need to see to it that everything is available to get it to you safely and securely. 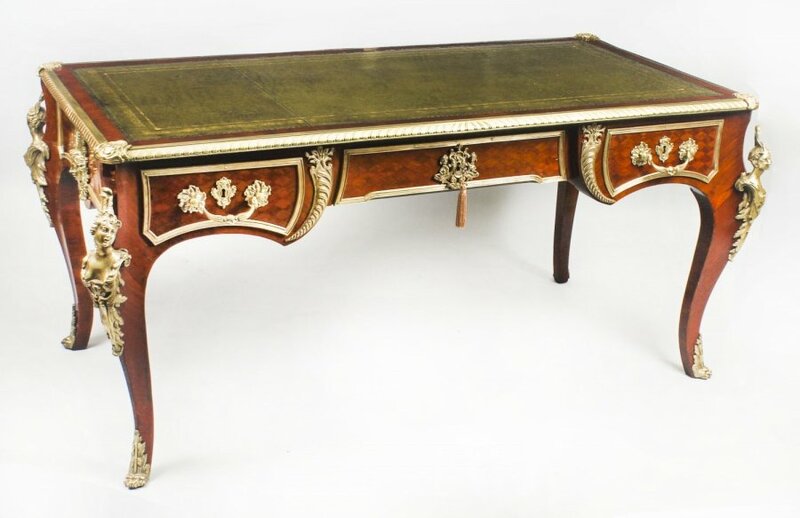 Please quote the item reference number for this antique ormolu bureau plat desk when getting in contact so we know exactly what the shipping needs will encompass. You will be happy to know that shipping is free to any mainland UK location. 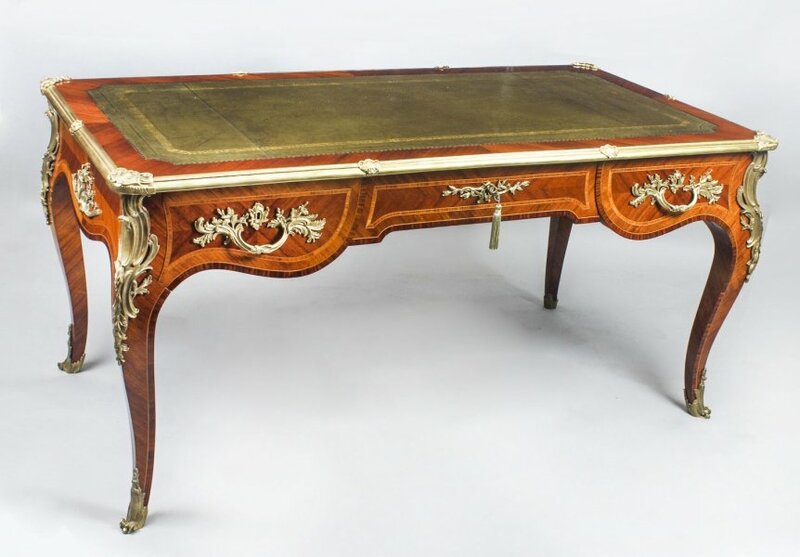 If you are not pleased with this antique ormolu bureau plat desk, we provide a 14 day money-back guarantee in compliance with the Distance Selling Regulations. If you do intend to return it, you will need to pay the return shipping charges, unless we sent you an item materially different to what you were anticipating or have mis-described it in some material way. You must send the article back in its’ original condition and packaging.